Laan Tulips > Laan Tulips News > Casablanca a tulip with history! 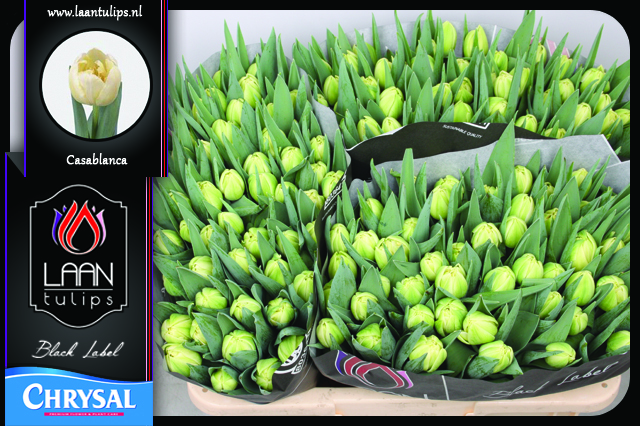 Did you know that Tulipa Casablanca is in our assortment for 38 years already? Casablanca is a a true classic that we still love to see in our greenhouse. In 1978 former owner Theo Laan acquired a handful of Casablanca bulbs from Simon Visser from Bovenkarspel. This hand of bulbs grew into a big collection which is still used each year by Laan Tulips for the production of cut flowers. With a weight of 40 grams and a length of 40cm Casablanca is available this week in Black Label at the Aalsmeer and Rijnsburg auction and are for sale at Floramondo.